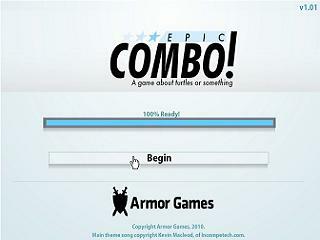 Released by Armor Games in 2010, Epic Combo! is a flash game where you unleash brutal violence upon unsuspecting turtles. Starting with a single hammer hit you knock the shelled reptiles off of as many strategically placed hazards as you can afford to chain together as many bounces as possible. Best time: 0:01:57.67 by Matan 'IsraeliRD' Weissman on 2012-05-18. This is my run for Epic Combo. I first watched a previous run while it was on verification and wanted to check the game out. After a while I beat that run so I started playing this game more seriously and an hour later I got 2:57, so I decided to start recording. Epic Combo ended up being a very luck-based game due to the randomness of the turtles shooting off the buzzsaws. This alone made the run pretty hard to do. The 'manual timeout' button is a bit glitchy as sometimes it doesn't take any mouse input (killed a few runs), and the combo number makes it unclickable on certain frames. The strategy I came up with is to get a proxy mine first and then smash turtles until all three valves are open, which is 3 seconds faster than not having one. Afterwards I unlock things a lot faster than I normally do, especially getting those three valves on level 5 within a minute. The buzzsaws' setup in this run is the most optimal one I found. The reason why I wait a few times for a second or two after levelling up on the valves is because the game actually needs to start producing turtles and I want more on the screen, so it's faster to wait a bit. I'd like to thank SDA staff for putting on a lot of time and effort into this site, and to you for watching.